Millions of people book flights for their Disney World vacation every year, but as flights have gotten more expensive overall, affordable and convenient airfare for trips to Disney World has become more difficult to find. Plus, for lots of families, a flight to Disney World might be the first time they've ever flown, and that can be stressful. 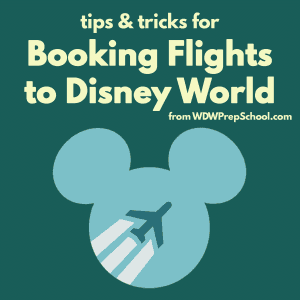 From booking your flights for your Disney World trip to navigating the airport, to what to expect when you get on the plane, we have lots of tips and tricks to make air travel a lot less stressful and hopefully maybe even a little less expensive, too. Every few months somebody emails us in a panic because they accidentally booked flights into Sanford International Airport instead of Orlando International Airport. Sanford is a lovely airport. It is small and easy to navigate BUT Magical Express does not go there and it is further away from Disney World. In nearly all cases, unless you can save a significant chunk on flight costs (and you were already planning to rent a car anyway) you'll want to fly into Orlando International Airport. Location & layout: The main airport that most visitors fly into is Orlando International Airport (MCO) which is located about 20 miles from Disney World. MCO is designed in a way that the gates are in 1 of 4 satellite buildings, and visitors ride the tram to get to and from the main terminal. On arrival, visitors take the tram/monorail from their arrival gate to the main terminal to get their luggage and to find their transportation. Ground transportation options: All transportation options that you'd expect to find in a major airport are available here: rental cars, taxis, shuttles, private car services, etc. If you aren't sure which is best for you, check out a comparison of different Orlando airport pickup options. 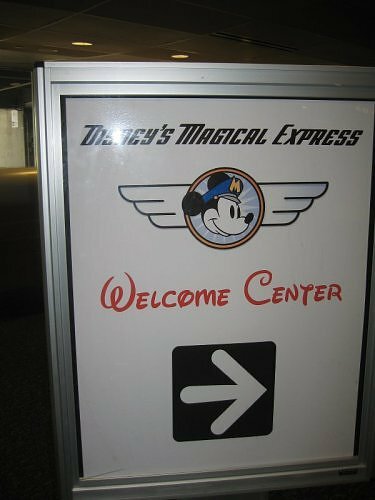 In addition to all the regular transportation options, MCO is also the only airport in the area that offers Disney's Magical Express. People who are staying on-site at Disney World and are planning on using Magical Express must fly in and out of MCO. After arrival, guests looking for Disney's Magical Express to get to their hotels should go to the B side of the main building and proceed to the first level. See the complete Magical Express overview for more info on how this works. 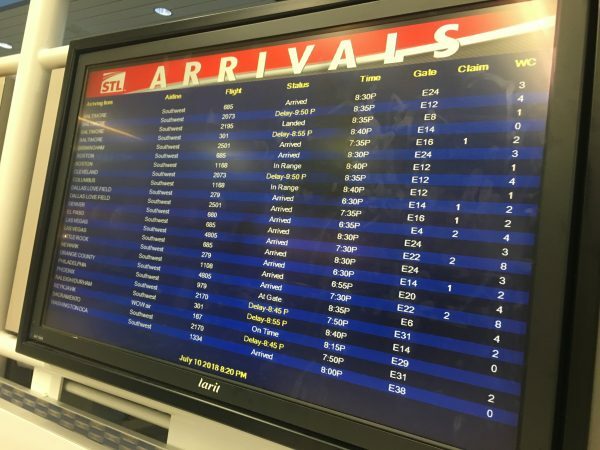 Millions of families fly in and out of MCO every year, and for lots of them it might be their first flight. The combination of first-time flyers and lots of families may mean there are longer delays than expected at the ticket counters and security checkpoints, so be sure to allow extra time. If you are using Magical Express, they take all that into account when they schedule your times. If you are in a situation where you have several hours to kill at MCO and you'd like some privacy, the Hyatt Regency (located inside the airport) has a limited number of Day Use Rooms that are available for a reasonable charge. These can come in handy after a cruise (if your flight home is late in the day) or if your flight gets delayed significantly. If you need a last minute gift before you head home, you can find lots of the most popular souvenir items inside Disney's EarPort and the Magic of Disney stores at the airport. In addition to gifts, they also have maps and Times Guides. Location & layout: Another airport option is Orlando Sanford International (SFB) which just serves a few airlines (Allegiant, ArkeFly and SST Air). It is located about 35 miles from Disney World. Ground transportation options: Rental cars, Ubers, taxis and limos are available to travel from Sanford to Disney World, but Magical Express isn't an option. This airport doesn't have the same amenities that you'd find in a larger airport. There are dining and shopping options available but they are limited, so be prepared if you are looking to grab something to eat before you board a flight. Make sure you factor in the cost of transportation if you are considering SFB. Sometimes you can save a lot of money on flights, but you may lose that savings paying for a rental car. If you do rent a car, don't forget to pack change for the toll roads. 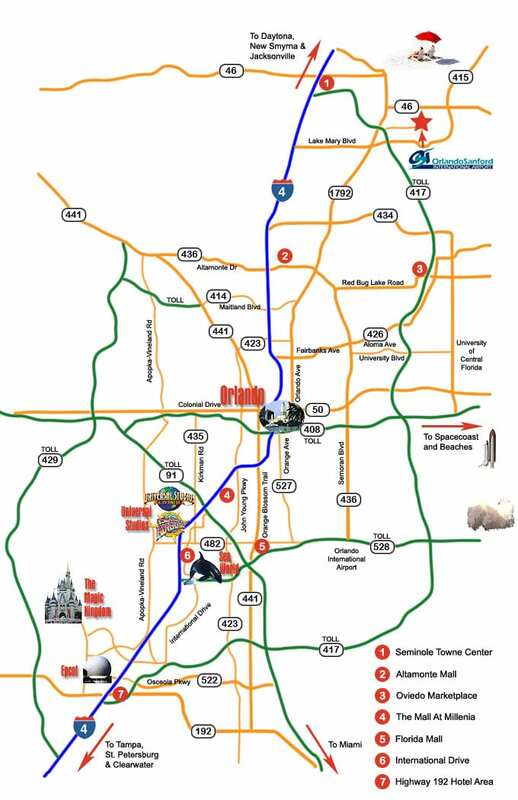 This map shows both airports as well as the most popular attractions in the Orlando area. In nearly all instances, the fewer connections you have, the less stress (especially if you have little kids). Getting on and off a plane can be tricky if you are navigating the aisles with car seats and diaper bags, plus, for some little ones, takeoffs and landings can cause discomfort in their ears. Not only does a nonstop flight mean less overall travel time (and consequently less hassle), the fewer legs to your journey also lessens your chances you'll miss a connection. This is good advice for everybody, but especially important for people traveling with children. Getting stuck due to a missed flight can be really difficult with little ones. One last thing - when looking at flights, don't be fooled by the lingo! Direct flights are not the same as nonstop flights. Airlines have gotten really, really good at nickel and diming creatively adding fees, including ones for assigned seats. Just because you are traveling with your family doesn't guarantee that you'll automatically be seated together. Airlines may try to make that happen, but it isn't always possible. The only way to ensure that your family will be seated in the way that works best for you is to pay for your seat assignments. Yes, that is going to make your ticket more expensive but if your children are younger (and especially if they've never flown before) you'll probably want to be near them, and relying on the airline or your fellow passengers to give up a seat that they might have paid to have assigned to them isn't a good strategy for either you or your kids' nerves. 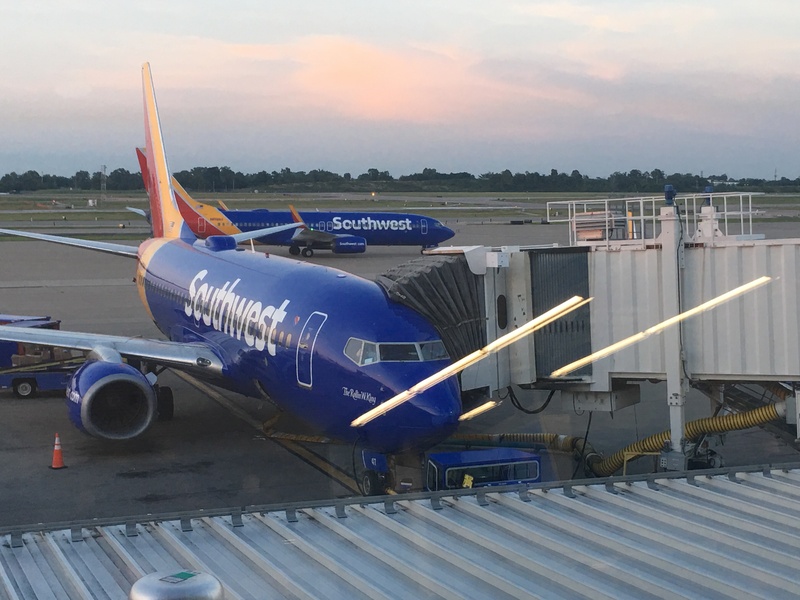 If you are flying Southwest (where there isn't assigned seats), we recommend paying the extra for Early Bird Check-In at least for your return flight home. 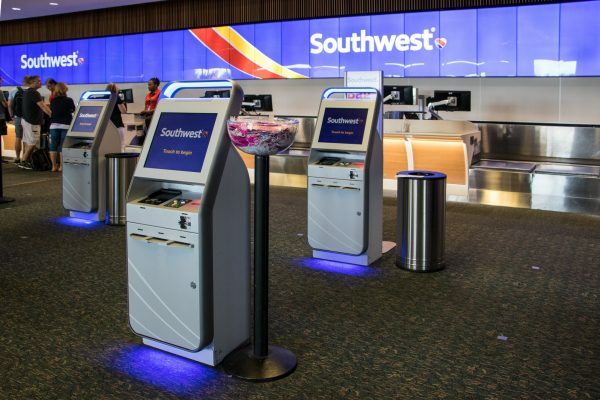 It is a lot easier to remember to check-in exactly at the 24 hour mark for your flight to Orlando, but depending on what you are doing on your vacation, it may not be possible to check-in exactly at the 24 hour mark for your flight back home. Yes, Southwest does have Family Boarding between the A & B groups. However, Family Boarding is technically only for families with children 6 years old or younger and considering a large chunk of people flying to Disney World are traveling with their families, that group can be as large as the "B" boarding group. Again, save yourself and your kids the stress of trying to find seats together and just pay the extra for Early Bird Check-in. If you have kids that might nap during the flight, the back is often a great place to sit because the hum of the engine can lull them to sleep. If you're flying on an airline that allows you to pick your seats, check out SeatGuru.com to see which seats are the best choices. Factor in all your costs before you book. For instance, Southwest's fare includes 2 free checked bags; other airlines charge for checked bags. Add up all the costs so you're comparing apples to apples when looking at flights for your Disney World trip. Tip: You can check Kayak's chart of airline fees which includes fees for baggage, meals and seat assignments. For price checking, the Matrix Airfare Search tool is a great. This tool is purely for research. Once you find a flight itinerary that you want, you book your flights directly with the airline. 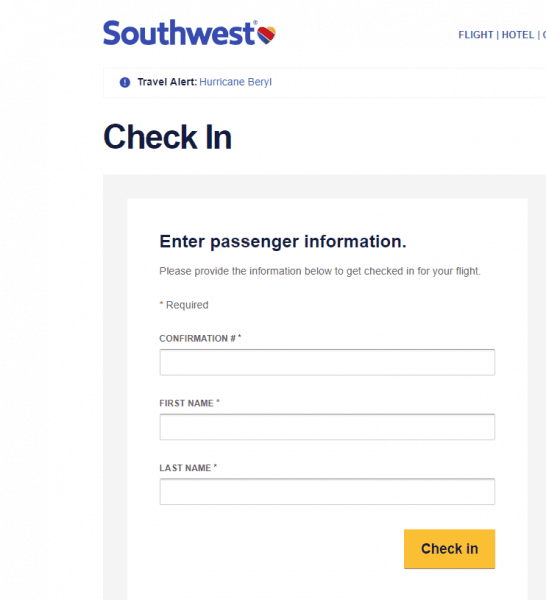 There isn't an airfare research tool that can search the low airfare airlines like Southwest or Allegiant, so you need to research those separately. Go to those airlines' websites to look up their pricing. The Matrix tool will combine different airlines on 1 itinerary sometimes. You have to book those itineraries on a site like Orbitz which will allow you to book multiple airlines. Otherwise, you would book directly with the airline. You can also use this tool to look for flights a month at a time so you can see when fares increase and decrease from day to day. Looking to try to save some money on flights? It isn't as easy as it used to be, but there are a few things you can do in order to increase your chances of getting the best price possible. Try different airports. Not only do you have the option of using Orlando International and Sanford International, but you can also try flying into Tampa's airport. It's about 80 miles between Tampa International Airport (TPA) and Disney World which might work out well if you have a rental car and can save a lot of money by switching airports. Fly mid-week. Most people fly in one weekend and fly out the next. You can often save a lot of money by starting and ending your trip on a Tuesday or Wednesday. Use Priceline. You can get cheap airfare by using Priceline's Airfare options. You won't know the times for departure so you'll have to be flexible but the savings might be worth it. Know when to buy. To check when to buy your tickets, use Kayak's flight search. After you search, this tool will show you info in the upper left that will tell you if you should wait or buy now based on the history of flight prices (or sometimes the site will say that it can't confidently predict the prices). Get notified about sales. To be notified about sales, you can use the "create a price alert" option on the Kayak tool mentioned in the previous tip, and you should also be sure to sign up on the email list for all airlines you might fly. You can also follow the Airfare Watchdog on their website and Twitter to be notified about fare sales. Airfare Watchdog's fare alerts allows you to set up an alert to email you every time a fare changes for your arrival and destination cities. This is a great way to find out about sales very quickly. 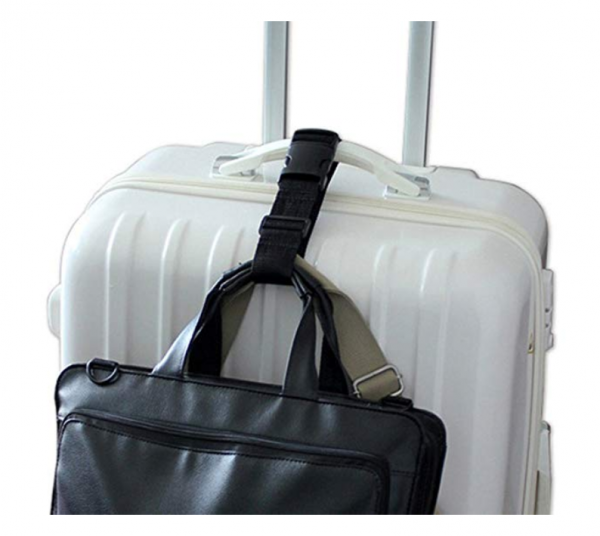 Nearly all airlines allow you 1 carry-on and 1 personal item (like a purse or a backpack). Some airlines now charge for any item you carry onto the plane, so keep that in mind, but if you are traveling on an airline that doesn't charge it may sound like a good idea to use the "free" carry-on allowance to save money vs. checking a suitcase. But, while this may sound like a cost saver it isn't always the best idea. If every ticketed person in your group has the maximum sized carry-on allowed plus a personal item plus any baby gear (like strollers or car seats) you are going to have a very difficult time navigating through the airport. In fact, the thought of trying to do that with younger kids (ones too small to put their own luggage into the overhead bins) makes my head spin. If everybody in your group is big enough to handle their own bags then go for it. But, if not, keep your total carry-on items to only the things that each member of your group can easily haul themselves. Even toddlers can handle a small backpack with a few items in it, but they probably aren't going to be able to handle a suitcase and a full-sized backpack themselves. I don't like spending any more for my flights than the next person, but please trust me: when cost is a factor, it is less hassle to pack lighter (and do laundry while you lounge by the pool) so that you spend less in bag fees than it is to try to board a plane with 2 kids, 1 spouse, 4 rolling suitcases, 4 backpacks, 1 diaper bag, and a car seat. Even if everybody can handle their own bags, you might want to consider straps that can link multiple bags together. Lots of luggage comes with straps that can do that, but if yours didn't you can buy inexpensive ones that can make it easy to strap a car seat to your carry-on or even strap 2 bags together (which can free up a hand). Need ideas on what to pack to keep the kids occupied? Check out these vacation travel bag ideas and don't forget to scope out our massive Walt Disney World packing list for ideas on what to pack for your entire trip. Every airline has maximum weight allowances and if you go over those you'll be charged extra (sometimes a LOT extra). Make sure you verify what the weight allowance for your airline is and then don't leave things to chance - weigh your bags. 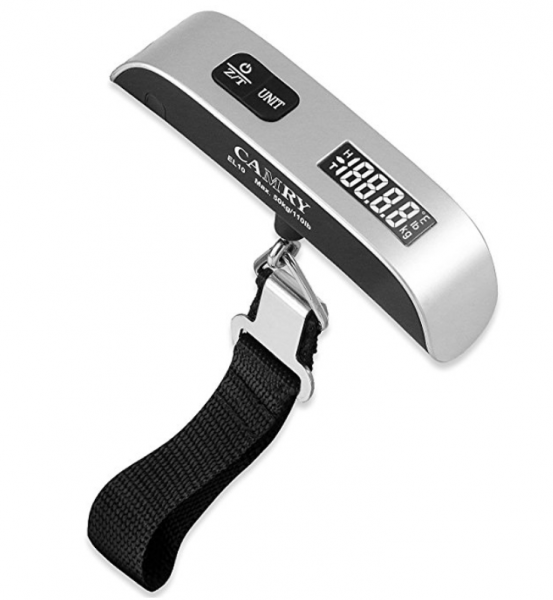 I like traveling with a handy and inexpensive digital scale. It takes all the guesswork out of figuring the weight. 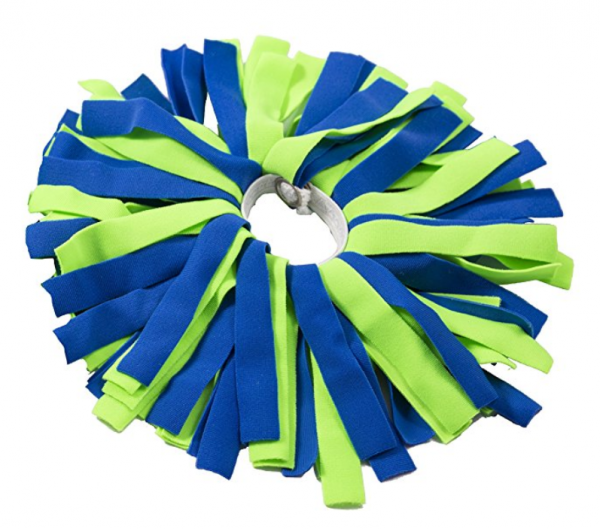 You can tie brightly covered ribbons around the handles or if you want to be fancy, you can purchase fun things like these pom poms. This is especially important if your luggage is black. Everybody seems to have black luggage and it can be easy to accidentally snag somebody else's suitcase if you don't have something on yours identifying it. And, make sure all your bags (even your carry ons) are labled with things like these cute DIY luggage tags. For young kids I'd recommend not putting the child's name on it, but at a minimum you'll want to include your phone contact information just in case you accidentally lose your bag. Make sure you know what they are so you don't accidentally put something in your carry on that won't be allowed through. There are special allowances for formula, breast milk, etc. You can find those on the official TSA website. On a recent trip I wound up with a head cold and if you've ever flown with a head cold before you know how painful that can be on your ears. I took a decongestant before I left for the airport but my flight was delayed and my meds wore off. Had I not brought my medicine with me I might have had a very uncomfortable landing. Never assume that you won't need your medicine before you arrive to your destination. Delays happen, and luggage can get lost. Always keep any medication you may need for the flight (like Dramamine and Sudafed) as well as your prescription medication with you in your carry-on. Whether you use an app or do it via a website, if given the opportunity to check in ahead of time, do it. Checking in ahead of time secures your spot and speeds up the process in the airport. Layers are your friend when traveling. Lightweight jackets that can be tied around your waist or stored in your carry-on are a good option. If you don't have TSA Pre Check, consider wearing slip-on shoes with socks so that you aren't walking around barefoot in the airport, and try to limit the jewelry (or anything else that can mess with the metal detectors) to make the security screening process easier. It is better to have time to waste than it is to be running to your gate. Most airports will have information on their website as to how early they recommend you arrive. If you are checking a bag you'll need to have your ID ready to show the staff at the counter. Tip: If you have little ones (and you have time to spare) some airports even have play areas. Use the GateGuru app to help you locate amenities within the airport. This will allow you to find where to buy things you might need, play areas, etc. Nearly all airports now have kiosks that allow you to check in, print your boarding passes, and in some instances, upgrade or change your seat selection and check your luggage. Using one can often speed up the entire process and save you time at the counter. 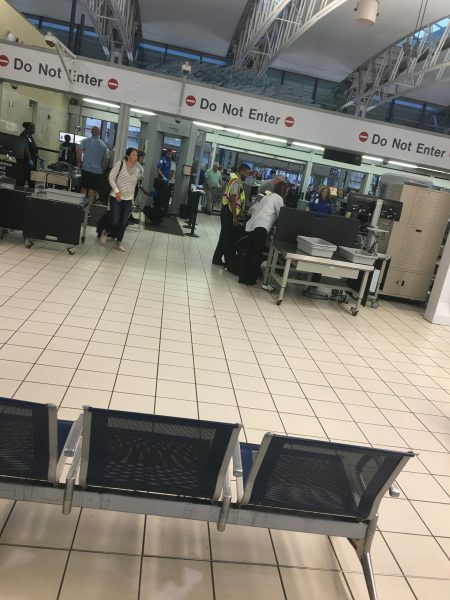 After you have dropped off your bags, your next stop will be the TSA Check Point. All adults will need to have an ID and every ticketed passenger will need their boarding pass. Remove all electronic devices larger than a cell phone and place them in a single layer (don't stack items) in a bin. Remove your shoes, and if you are wearing a big belt or lots of jewelry, you may want to remove that too (as it can often set off the metal detector and trigger additional screening). If you do need to remove jewelry (or anything from your pockets like a phone) it is better to place it inside of one of your carry-on bags rather than putting it loose in a bin. Pull your 3-1-1 quart-sized bag of liquids out of your bag and place that in a bin. Backpacks and purses often don't need a bin; you can just put them directly on the belt to go through the scanner. If you are traveling with children, they'll have to go through TSA screening, too. If your kids haven't ever done it before they might find the process a little intimidating or scary. Once you get to the other side of the checkpoint, gather up all your belongings and double check to make sure you have it all. Nearby, there should be chairs or benches available for you to use so you can sit and put on your shoes and reassemble your bags. Once you are through security you are welcome to purchase drinks and food items to take with you. If you brought an empty water bottle, you can fill that up at this time, too. Most flights begin boarding around 30 minutes or so before departure. If you have multiple carry-on bags, you'll want to get those organized for the flight and make sure everybody has gone to the bathroom one last time before you board. Tip: When the airline calls for people with children to board early, consider if this is really the best idea for you. If you need the extra time to get set up, take advantage of the opportunity. However, if you don't need the extra time, stay off the plane as long as you can to allow little ones to run around and not be confined for any longer than they need to be. When you board the plane, your personal item (like your purse or backpack) will go on the floor under the seat in front of you and any larger carry-on items get stowed in the bins up above. You can use your personal electronic devices on the plane (in airplane mode) but anything larger than a tablet will need to be stowed during takeoff and landing. 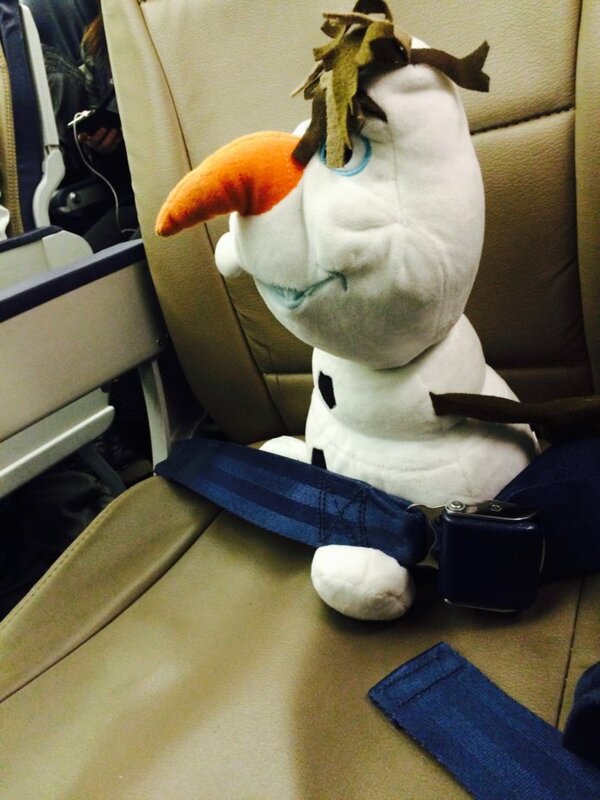 Your tray tables must be closed and seat backs left in the full and upright position during takeoff and landing. Lots of flights offer wifi (for an extra fee) but you usually can't stream apps like Netflix on them. Some airlines (like Southwest) offer free in-flight TV but you'll need to use your own device in order to access it. For your safety, you'll be asked to leave your seat belt on at all times (even if the light is off); however, you are able to unbuckle to move around the cabin when the "Fasten Seat Belt" light is off. Take off and landings can be tough on ears. If you have a little one, letting them drink from a bottle (or breastfeeding if they are a lap baby) can help them equalize the pressure. For older kids (and adults) chewing gum or drinking can help if you can't pop your ears on your own. After you land, you'll have a few minutes to wait for the plane to taxi to the gate and for the ground crew to get everything ready so they can open the door. 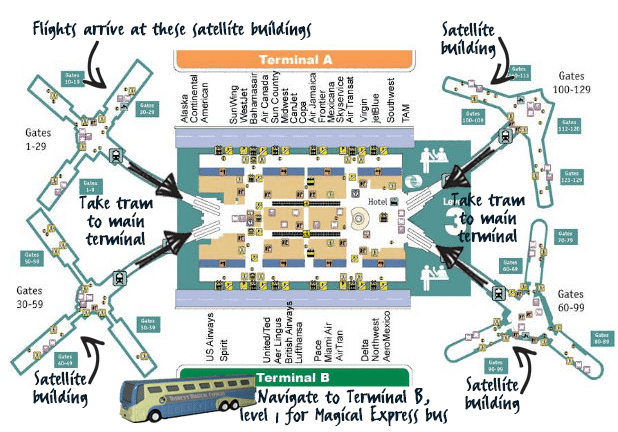 Once off the plane, everybody (including those taking Magical Express) will follow the directions to the main terminal. Getting to the main terminal from the gates will require you to board a tram. If taking Magical Express and you are letting them deliver your bags, you can go directly to Magical Express on level B1 and use your MagicBand to check in. Everybody else can head to baggage claim. If the flight attendants didn't announce where your baggage claim would be located you can find the carousel number on the large ARRIVAL boards you'll see throughout the terminal. After you grab your bags or get onto Magical Express - that's it! That's all there is to it. If you are staying at a Disney Resort - regardless of if you plan to use Magical Express or not, you can use Resort Airline Check-In. We 100% recommend it. It is free and makes the day you return a lot less stressful! Have any questions about flying or tips on how to get the best deal for your flight? Leave a comment below and tell us about it! Shannon, thank you so much for the time and efforts for so much information in your blogs. FYI: Sanford airport (SFB) serves only a few airlines but no longer the Dutch ArkeFly. From 1 October 2015, only the name TUI is used for the activities of Arke. From March 2017, the name of the aviation division of TUI was officially changed to TUI fly. My quick tip for boarding with young children- if you have two adults, let one board first with any luggage or car seats. That person can install the seats, wipe down tray tables, etc. The second adult can board with the kids at the very last minute. They walk right on and go right to their already prepared seats! Hi, Vickie – I’m not aware of group rates for flights. We had a group of 11 last November and Southwest gave us a group rate. I love using the ITA Matrix. I use their advanced routing codes to more easily find long stopovers or even open jaws. Its also the easiest tool to use probably that allows you to search by Alliance if you’re trying to find ideas for award travel. Plus, you don’t have to worry about things like ads distracting you while you search! If I book my flight outside of the disney website (where I reserved a hotel and park passes) will I still be able to use the Magical Express Service and will my bags be transported to the hotel for me? For reference I am planning on staying at the Caribbean Beach Resort. So, if you do get a fantastic deal to fly into Orlando Sanford, how do you get to Disney from there? My mom saved a ton, but she can’t rent a car because she’s disabled. I’d take an Uber or a town car. I get into orlando early, before our room is ready, is downtown Disney a good option? We are staying off site, so do they have parking at downtown Disney? How much is it to park at the parks each day ? Is there bulk pricing? I always fly overnight, getting to Orlando around 6:00 AM. We then pick up the rental car and eat to breakfast anywhere on the way to the hotel. Then we go to the hotel and ask if the room is available. Everytime we asked, the room is ready and they check us in early at no cost. A nice two hours nap then off to Downtown Disney until dark. So, Sharon, YES, Downtown Disney is a wonderful idea just to get the Disney feeling. Thank you! We are going to Disney World at Christmas 2015, I am looking at flights already and am a little overwhelmed at the cost. Thank you for doing all this work! Shannon, thank you so much for the time and effort you have spent to compile all of this information! I’ve spent hours perusing your site and I keep telling my boyfriend: “this woman is incredible”. 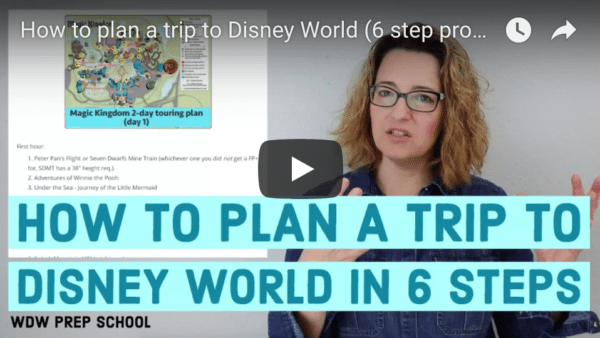 I consider myself a research fanatic (as far as I’m concerned, Matrix Airfare Search is the best thing since sliced bread) and I’ve already planned one trip to Disney World, and you’ve still managed to teach me a number of things I didn’t know! I wanted to suggest a flight explorer tool I recently came across: http://www.hopper.com. It provides some similar data to the Kayak tool (gauges interest in specific flight routes, tracks prices, etc.) but it offers some nice additional features that make it a very well-rounded resource when it comes to shopping for flights. Just booked a trip for November! I’m starting to look into flights now and was wondering what time for arrival do you suggest with the 3pm check-in? If we arrive early is there things to do before our room is ready? I’d hate to arrive later than check-in and waste a day. thanks! This is a weird question, and you may not know, but is it possible to not tell my kids they’re going to Disney World until we get to the place where the bus picks us up (we are staying at Animal Kingdom and will ride the Disney bus from the airport to the hotel). My husband says yes, but I am thinking that surely there’s just Disney stuff everywhere, and wouldn’t doubt that the flight attendants even talk about it. My kids will be almost 10, almost 7 and 3 when we go. I think that they’ll catch on and we won’t get that moment when they all of a sudden realize where they’re going, especially my oldest. Yeah, there is Disney stuff everywhere and many flight attendants will mention it but you could tell your kids you’re going to Florida for something else maybe? I couldn’t have pulled it off w/my kids because they always wanted to know details. Maybe you could tell them at the airport when you’re departing your hometown? Do you recommend a car seat for a 2 year old on an airplane? We’re traveling to Disney by Southwest in September and I can’t decide if it is worth it or not. Help! After reading almost everything on your blog, I went ahead and booked our flight tonight! I love the tools you shared to gage whether or not you should book now or hold off based on price changes. Snagged a great nonstop flight that will allow us to get there midday and leave late afternoon. You have helped answer so many of my little details for our trip as I’m doing the last of my planning! W0uld you recommend a connecting flight with a very short layover (to minimize downtime) or a very layover (to reduce risks of missing a connecting flight)??? If we have to do a layover, I like 1 hour layovers for domestic flights (2 hours for international). Wow. I cannot believe how much information you provide in your blog. Most blogs that share Disney tips, deals, and information are pretty consistent all across the board. I hardly run into something I didn’t know, some blogs just include a little more information than others… your blog on the other hand goes above and beyond. THANK YOU for investing your time, energy, and vacation/free time to Disney. I appreciate all the information you share. I won’t comment on every post but I’m reading them. Flights have been the biggest reason that I don’t get moving with my WDW planning but you have now changed that. Again, THANK YOU!!! Thank you, Victoria! I appreciate you taking the time to say that. Comments like this are the fuel to keep churning out content for people who appreciate having good info.